Editor's note: This was supposed to go to press last Wed which is why I am referring to Sunday as a school day. Sometimes it's hard ot find the right ending. I went through about six before picking this one. It was the spring of 1985. VH1 had just been launched. Hagar took over for David Lee Roth. Live Aid was just around the corner and I anxiously awaited the new live album from Styx, Caught in the Act. As I’d sit in Mrs. Clark’s World Lit class, I’d daydream while drawing my version of album covers all over my spiral tablets. I was particularily good at the Men at Work Cargo art work. Mrs. Clark was my favorite teacher at Union County High. It was not so much because I learned so much from her but I appreciated the way she treated me. She was funny and sarcastic but also kind and never hurtful to the students. This was the opposite of how her husband, Mr. Clark, ran the show. He loved to tease but it often went over the point of humiliation. Mrs. Clark was one of those teachers who if she saw some flame inside of a student. Mrs. Clark would fan that flame into a force to be reckoned with. 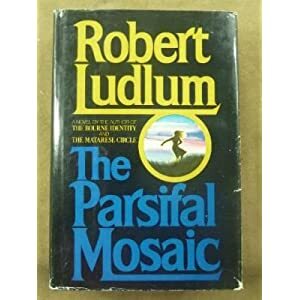 So it was after I read Robert Ludlum’s The Parsifal Mosaic when I became hooked on spy novels. I also realized Mrs. Clark’s statement might have been the smartest thing any educator ever told me during high school. I still live by this notion today and even teach my students this simple idea. I just wrapped up the Game of Thrones series so now I working my way through the Great Depression Circus story, Water for Elephants. I have some non-fiction by Bill Bryson next. My reoccurring theme in this blog is how history repeats itself. Often my recollections revolve around the antics of Roni and Jude. Today is something a little different but after it happened, I understood this must be written down for me. 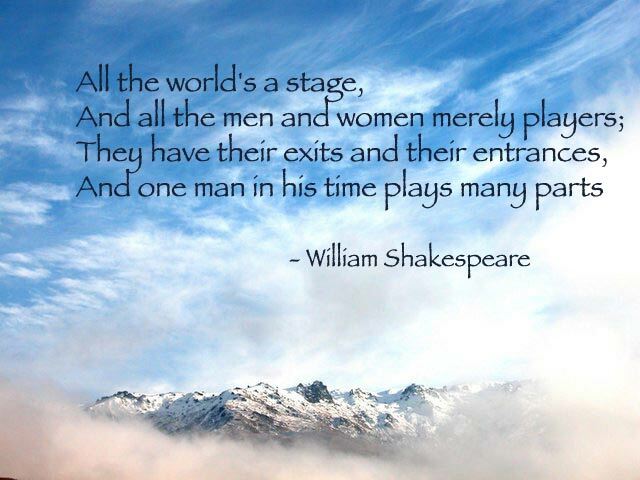 About the time I was in Mrs. Clark’s World Lit, she introduced us to Shakespeare through his play, As You like It. It was not the painful experience I had anticipated this process to be. I even enjoyed a bit. I handled the play just fine. 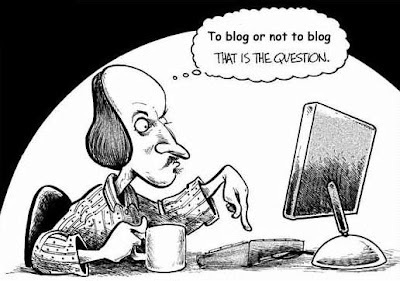 The issue came when Mrs. Clark had us memorize and recite passages from Shakespeare’s works. She assigned me to perform the “All the world’s a stage speech. I never bothered to memorize past the first few lines and got a whopping score of 3. At the time, I recognized the relevance for me to learn this stuff yet I just put it off. This alwasy bothered me a bit because I felt like I had let Mrs. Clark down by my lack of effort for memorizing the speech. One time I was up during for a visit to Mom up at Young Harris. Mary had gone off to college so Mom was by herself. While I was up there, I decided to go by my old high school but never made it after talking with the neighbors. Apparently, Mrs. Clark had died of a heart attack shortly before my Dad had his. I had lost my chance to apologize. Paul Sidney is my work colleague, fellow blogger, and friend. 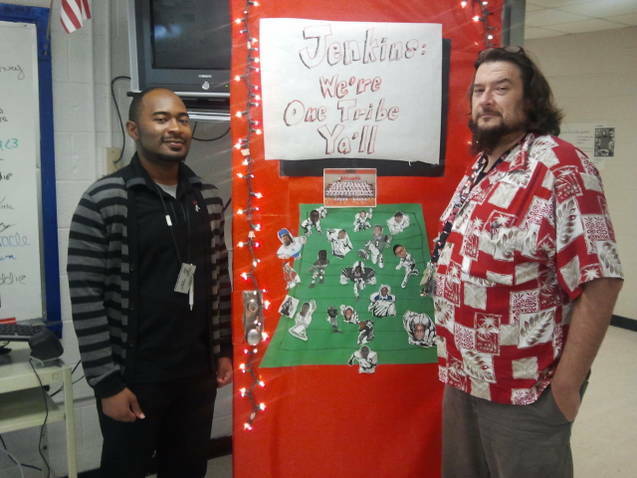 We have been working together and teaching Brit Lit for several years. We have gotten pretty good at it and have introduced Macbeth, the cast of Twelfth Night and Julius Caesar to a new generation of kids. Every year, I crack up at how our students groan and hate reading the passages aloud. By the end, most of the kids are into the way of the Bard. Paul and I have just finished our segment on Macbeth and we are moving on to how Shakespeare lived. For our journal today, Paul had come up with using the “World’s a Stage” speech and relating it to our society today. The kids weren’t getting it. Something inside of me clicked and I read the passage aloud with drama and emphasis. Afterwards, Paul and I broke it down to relate this to our students’ worlds. As we’d go through each stage, I was transported back to being 15 year old Robby and began remembering all that info Mrs. Clark taught me during my junior year. 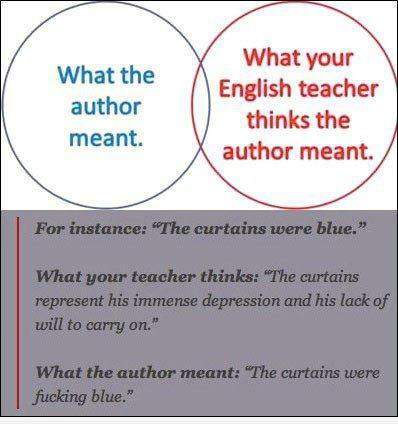 It worked for me then and somehow that magic Mrs. Clark had with Shakespeare worked on our students. Sorry for the language but it really does say it all. Afterschool, I made my daily trek back to my car up in the front parking lot. Usually, I am tired and ready to get the hell out of Dodge. Today was different. I felt good about the work Paul and I did. I was satisfied. I’ve lost my chance to have those moments with Martha Clark of Union County High School and to thank her. I wish I could let her know that because she took the time to open up my world, she not only changed my life but gave me the desire to change others through teaching. I’ll never get the chance to apologize for being so irresponsible for my assignment but I feel like I made up for it today. Instead of just throwing out a bunch of words and phrase in my short term memory, I used a long forgotten lesson taught by Mrs. Clark. In a way, I didn’t teach my class today, Mrs. Clark did. I hope Mrs. Clark was able to see what I did with my students today and realize that she is still teaching what she loved 27 years later. I often write about how history repeats itself and today I found myself in the role of the mentor whom I have enormous respect for. As a teacher, I hope that I impart a love of learning to my students. I think most of us are into education for partly that reason. I believe the other reason is more personal. Somewhere in that nightmare we called high school, an adult took the time to make a difference in our lives. As way of saying thank you, I think most teachers want to pass that influence on to their own students and hope they make that same difference. I find it ironic how Mr. and Mrs. Clark influenced me as a teacher. Mr. Clark taught me what not to do. My nature is to tease but he taught me the line which Mr. Clark crossed way too many time during his miserable math classes. Teasing is fine. Ridiculing a student is not. Mrs. Clark is on the postive side of the teacher influence spectrum. I am glad to hear her voice in the back of my head when I get a kid to pick up a graphic novel or anthing else besides The Hunger Games. Thanks Mrs. Clark, for introducing me to Shakespeare. Thanks for getting me to read outside of my comfort zone and introducing me to as much larger world. It’s an odd feeling to be a teacher now and to realize how some of the smallest lessons you taught me has become a larger part of how I do things. But I guess that is what a great teacher does.